eConsult has been developed by NHS doctors and has been in use in the practice very successfully over the last couple of years. It has great self-care advice and helps you determine the right course of action for anything from a sore throat or a bad back, skin problems to fertility advice. If any of your symptoms are seriously worrying, the system flag that you need emergency help. Twice a year NHS England sends out millions of questionnaires asking people about their experience of general practice. Recipients are chosen at random from all over the country. The results provide an important 'patient-eye' view of the services provided across the country as a whole (to inform the Government if their funding is effective/sufficient, for example) - and also details on specific practices. No personal information is gathered, but the more people that complete the survey, the more accurate is will be. We, and the national team, would encourage anyone who receives a survey form to complete and return it. Thank you. Dr Jane Peckham, who has been a GP partner at The Wilson Practice for 24 years, retired from the partnership at the end of March. She will be sorely missed by patients, by everyone in the practice and by colleagues across North Hampshire. Dr Peckham is stepping back from the partnership in order to develop her wider interests both medically and personally: she plans to continue her work on leg ulcer treatment and to work as a GP in Hampshire and the Isle of Wight in a more flexible arrangement. Dr Daisy Salt joined the practice in February as a GP Registrar and will be with us until the summer. Dr Rickard provides her mentorship in the practice. We are working with Bentley Village Surgery, Boundaries Surgery in Four Marks and Chawton Park Surgery as ‘The A31 Group of Practices’, to offer patients access to additional GP and nurse appointments. From the beginning of May it has been possible to book routine appointments with a GP or nurse on weekday evenings until 8:00pm and on Saturday mornings from 8:00am – 10:00am. The clinicians working in these clinics are not available for urgent or emergency medical needs or for home visits. To book an 'Improved Access' appointment, please speak to a member of our reception team by calling on 01420 84676 or popping into the practice. Unfortunately the constraints of the 'shared IT system' means that currently you can only book these appointments during our normal hours (8:00am - 6:30pm Monday - Friday), and they cannot be booked on-line. If available, you will be offered an appointment one of the four participating surgeries. These sessions are staffed by doctors, nurses, healthcare assistants and receptionists from across the group of practices. You will be asked for your consent to share your medical records before an appointment is made for you with a clinician who does not routinely work for The Wilson Practice; if you provide consent it will enable that person to see your medical records and enter the details of your consultation into them. NEW FROM 1 October is a link with HantDoc (North Hampshire Urgent Care) to offer routine GP appointments on Sunday mornings (9am - 12 noon) for patients across North Hampshire. These 15 minute appointments are at Basingstoke Hospital (RG24 9NA) and are also bookable through Reception. If you are 24 you will be receiving your first-ever invitation for a smear test in the next few months. It’s a late-ish ‘coming of age’ event – and one you should not ignore. 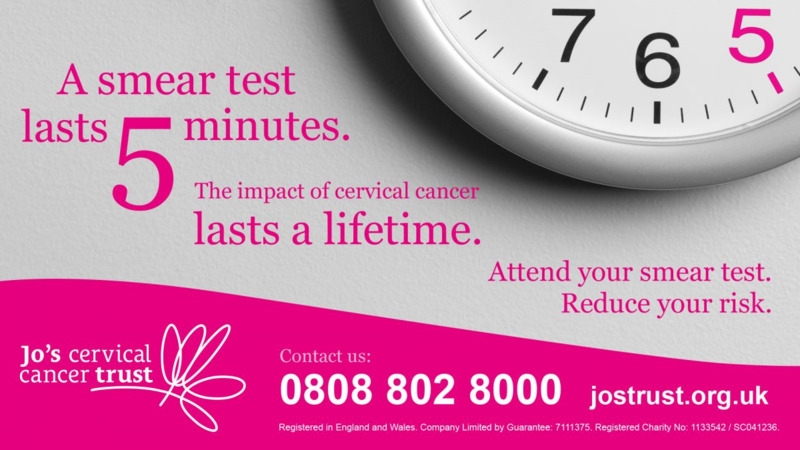 You’ll be invited for a smear every five years – but as the poster says – it’s five minutes from your life – and it could save your life – so don’t miss your first one. 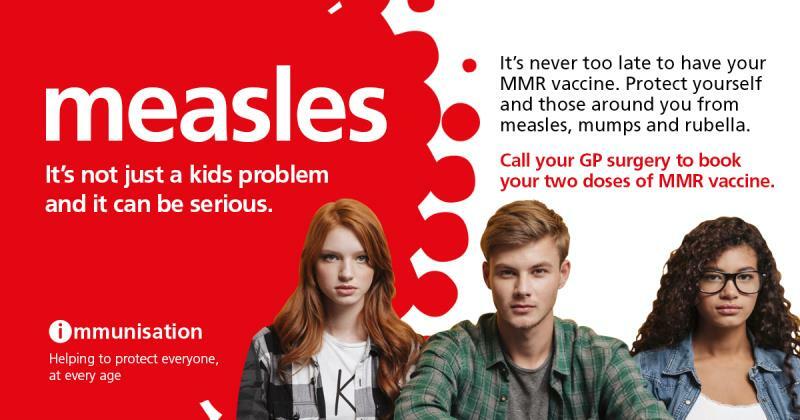 Measles is on the increase in England - are you protected? We welcome patient feedback on the care and treatment we provide, and suggestions for changes or improvements you would like the practice to consider. You can complete a very simple paper survey in the surgery, or you can do it on-line by clicking 'Would you recommend?' (below) or at www.leavemyfeedback.com/4674. You can also leave feedback on the NHS Choices website (www.nhs.uk). Your views are important to us. Thank you for taking the time to respond. Why might this be useful? You can check results of blood tests, refer back to recent consultations, confirm your medications or immunisation dates and refresh your memory before attending an outpatient appointment, for example; and of course, you can ensure we have your latest contact details. Click here for an application form. You will need to come to the surgery in person with the completed form plus photo ID and proof of address to register for this service. There are a number of services, including a FREE FLU JAB, available to carers to help them look after their own health. Please take a look at the Carers section below.